Paris – Athens, Greece, or Athens – Paris, just 79 euro! Rome or Milan to Athens, just 69 euro. Wow! Aegean Airlines is offering these ticket prices until September 15, for travel between October 15 and December 17, 2009. Now’s the time for an Athens break. Chicago – Athens, Greece – How about Athens for Thanksgiving? We’ve found rates from Chicago to Athens for $714 round trip on Turkish Airways, $816 round trip from Los Angelos to Athens, Greece for $816 round trip on Swiss Air and $732 round trip from New York City to Athens, Greece on Delta and on Air France. 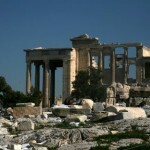 PreviousAthens Travel: When is the best time to visit Athens? NextAthens Travel: Eat in Athens, under 5 euro, views free!